I'm sad to report that a motorist in a Ford pickup has killed a 65-year-old Arizona man cycling in Bike Florida's bike ride this week in Alachua County. A 23-year-old driving a Ford F-250 pickup truck drifted onto the shoulder of a road in Newberry, FL and killed Robert Paul King, 65, of Prescott, Ariz. Wednesday at 12:42 pm. The Gainesville Sun Web site provides more details. One group hopped the bus. If you can, ride your bicycle to Ella's restaurant -- the starting point for the Hub Grub Bicycle Ride on Saturday at 3 PM. But if you need to drive your car, I'm told by the Ella's manager that the small parking lot at Ella's is off-limits because it has to be available for the 5 PM regular customers. So, please park your car anywhere around Seminole Heights or nearby side streets and bike over. At this evening's hearing, SWFBUD enthusiastically spoke in favor of a Florida Department of Transportation plan to build a $20 million multi-use bicycle/ped trail along the Courtney Campbell Causeway, including a $13 million tall span next to the State Road 60 bridge on the Tampa side. Linda Saul-Sena, a former Tampa city councilwoman, voiced her support. And so did John Harrison, a county greenways committee member. SWFBUD and Karen Kress of Tampa BayCycle met two Tampa police officers this afternoon to see a new bicycle safety message that will initially go on the back windows of 40-50 police cruisers. Thank you Sgt. Carl Giguere and Cpl. William Shaw for thinking of bicyclist safety. Stadium Toyota is paying for this. Sgt. 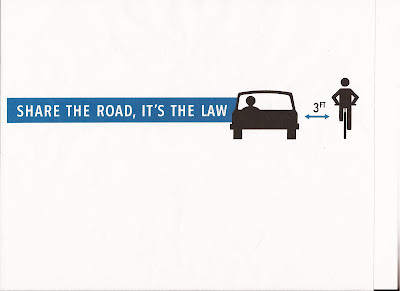 Giguere said TPD would like eventually to have all police cars in Tampa with this bicycle safety design on the back window. One of the great bicycle experiences of my life was bike-commuting 24 miles from my rental in Northvale, NJ near the Rockland County, NY border to a former job with foxsports.com at 6th Avenue and 18th Street in the Chelsea neighborhood of Manhattan, just south of mid-town. It included biking over a ridge in Bergen County, NJ to reach Route 9W on the west side of the Hudson River; pedaling south on Route 9W for about 10 miles to the George Washington Bridge; biking over the GWB to upper Manhattan and 177th Street; biking a few local streets and getting to Riverside Drive; and then heading south along the West Side to 72nd Street, 11th Avenue before zig-zagging on local streets to the Bed, Bath & Beyond Building where I started a sports-business web site for foxsports.com in 2000. What a bike commute! Faster than bus and train and amazing savings compared to a car. It was the best way to go. Here is the pic of the side door to the building where I would roll my bike in and lock inside next to a freight elevator. I was in Manhattan recently for business and took some time to check out the bicycle lanes and bike culture of NY. The City wants to be a world-class bicycle town and by the looks of the amazing bike infrastructure and the proliferation of bike lanes all around Manhattan, New York is on its way. I also visited the new High Line elevated pedestrian trail (off-limits to bikes) on the West Side, a half-mile raised trail on an old freight line that would pick up and drop off items in buildings along the rail line in the 1930s. And a few iconic buildings are thrown in here, too. The High Line Trail is a linear park trail on the old elevated freight line on Manhattan's west side. It runs about a half-mile and opened nearly two years ago. Another 10 blocks to the north will be opening this spring. Elevated trail even includes a stage/seating area. Here's the end of the trail -- it's the meat-packing district across from New Jersey. Trail goes through several buildings. View from the trail -- note another bike lane. Hotel on the trail -- windows provide stages for exhibitioners. Big Daddy Gary Kane -- I was right of college when I met Gary in the Auburn bureau of the Syracuse Herald-Journal and Post-Standard in 1983. We've stayed good friends ever since. Gary went on to have great careers at the Palm Beach Post and AP. He lives with his girlfriend Jen in the east Village and he does documentaries now. Here's Gary in the famous Strand Bookstore. After breakfast with Gary we sauntered to an East Village flea market and bicycles are big sellers. Union Square -- a place for a good protest. Empire State Building -- or as Bugs Bunny would say, Umpire State. Flatiron building-- another NY icon. St. Marks Church -- also used for community theater. Stripped bike -- probably was abandoned. Giant mt bike in the background still used on the streets of NY. My former Hobart College and bicycle pal David Regen got an unusual visitor at dinner time one day this week -- two New York Police officers who came to his apartment on 103rd Street in Manhattan and who said a speeding ticket given to David for biking too fast in Central Park (25 mph down a hill) was a mistake and that it was voided. David said the police apologized! It was a great day in Tallahassee as I represented SWFBUD at the Florida Bike Summit, where I met state Rep. Janet Cruz and state Rep. Betty Reed -- two state lawmakers from Tampa. I travelled with Jim Shirk, king of the bicycle volunteers of Tampa Bay and chairman of the local MPO Bicycle-Pedestrian Advisory Committee. We asked Reps. Cruz and Reed to support legislation for a ban on texting while driving and asked her to support future proposals for a vulnerable user law and to oppose the elimination of the greenways and trails department. It was also nice to see fellow Tampa area folks who won Florida Bicycle Association awards such as Tina Russo, Bevin Maynard, Sharon Monahan, Lori Snively and Cris who runs the ALS ride. There was also some behind-the-scene discussion of a proposed bike-ped safety ad campaign for the Tampa Bay area titled, "You vs. Vehicle: You lose every time." 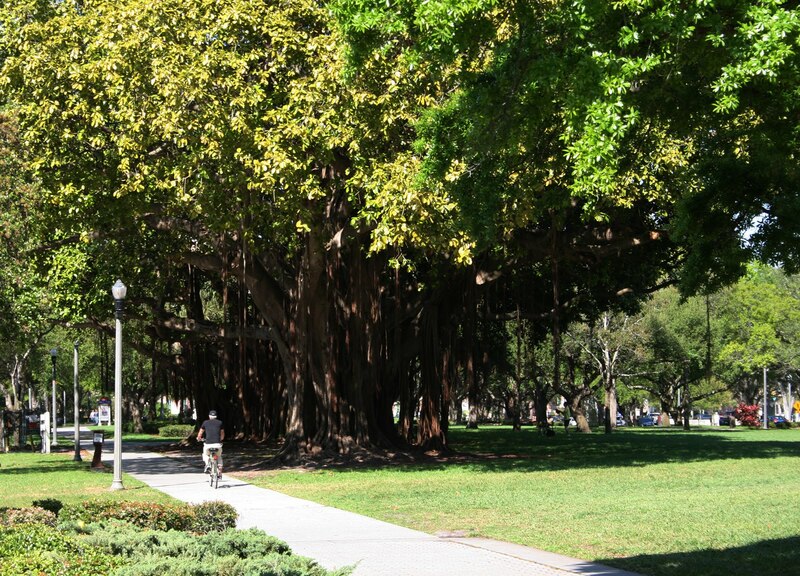 The rather ominious sounding campaign prompted Dennis Scott, the Florida DOT's bike -ped coordinator to contact the local Tampa Bay District 7 office. We shall see. He knows Tampa needs to improve its collective bicycle IQ and take steps to reform a bicycle scene that is characterized by too many bicyclists getting hit and killed by motorists. I also welcome a new Tampa City Council, a majority of which gets it. Council members Mary Mulhern, Lisa Montelione, Yolie Capin and Harry Cohen get it. Mike Suarez has the potential to get it. Charlie Miranda is clueless about bicycling. But all we need is four out of seven and I believe we have a majority who care about bicycling and will take action to get staff to do more. I was at Channelside to share the Buckhorn victory celebration. Congrats on Tampa's new mayor. Firefighter Todd Bulger manned a polling site at a south Tampa church on Bay-to-Bay. Before I hit the Buckhorn party, I met Ed Turanchick, a mayoral candidate who threw his support to Buckhorn, and Brian Maholm, a Tampa resident and Buckhorn supporter who wants a new Rays baseball park in downtown Tampa. Congrats to City Council District 3 winner Yolia Capin. The Buckhorn campaign bicycle trailer also included a Yolie sign. Michael Fox worked in the trenches to get Yolin Capin elected. The Bob Buckhorn for Mayor Bicycle Trailer was rolled out this morning on Election Day. 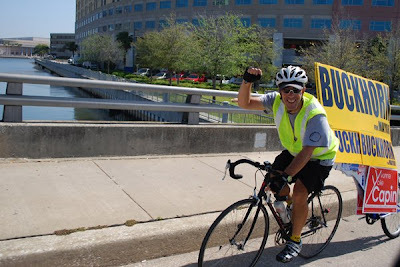 Bob has pledged to make Tampa more bicycle-friendly -- which is why I am supporting Bob. The rolling billboard hit 21 miles before noon and will be back on the streets of Tampa this afternoon and in the Channelside area later today for Bob's election party. SWFBUD is proud to hear this morning that a friend of SWFBUD -- state Rep. Janet Cruz, D-58, -- is sponsoring a bicycle safety bill. SWFBUD has worked with Rep. Cruz in the past year to further the cause of bicycling in the Tampa area. Cruz has voiced her support for a paved bicycle trail along the Bypass Canal in the Tampa area and also appeared at a memorial bike ride last Oct. 1 to memorialize the loss of bicyclist lives on the roads of Tampa Bay. SWFBUD gave a SWFBUDDY award to Rep. Cruz at last year's Bicycle Bash and appreciates her dedication and commitment to advancing bicycling and making bicycling safer in the Tampa area. I'm happy to say that the local Florida Department of Transportation office furnished me with some 200 reflective safety bracelets that will be handed out to all Hub Grub Bicycle Ride participants on April 2. Thank you to Jeanette Rouse of the local DOT safety office for providing these very cool safety bracelets. 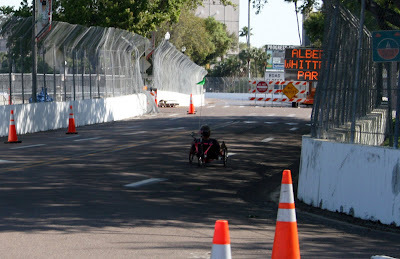 "I am coordinating the volunteers for the Cigar City Brewing Criterium bike race next Saturday, the 26 of March. Is there any chance that the two of you might want to come downtown and volunteer for a couple of hours? I am in need of course marshalls- spend a few hours in the sun keeping pedestrians off the route. Bring your lawn chair. I have other options too. Thanks! Susie http://www.facebook.com/susie.nelsoncrowley"
Jeff Houck, the premier food writer of the country who happens to live right here in Tampa Bay, took a few photos of bicycle life in downtown St. Pete. Some cool bike lock action near the museum downtown. Here's the latest entry for this weekend's grand prix race. 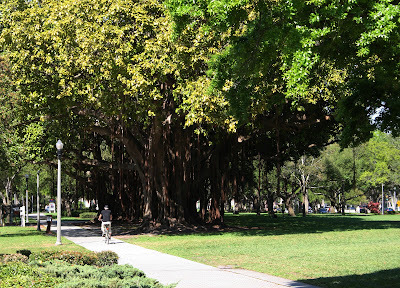 St. Pete has some major banyon tree action going on. 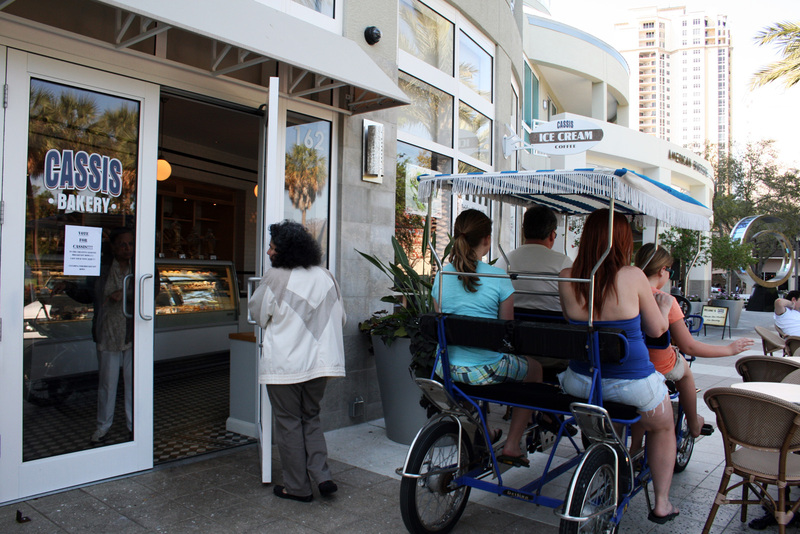 Tight squeeze to get by this bakery. 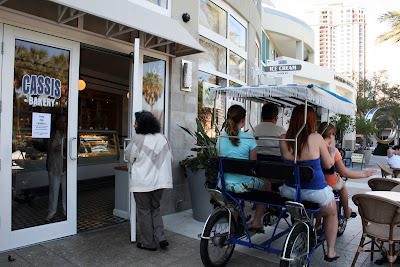 The tourists like to rent these bikes and pedal on the sidewalks. And Happy Birthday wishes to bicycle commuter and Bicycle Stories reader Nick Griffiths, who bikes from his Seminole Heights home to the Moffitt Cancer Center every day. 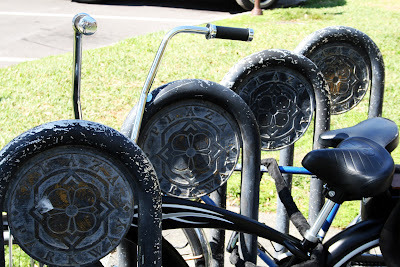 Nick bikes with the Seminole Heights Bicycle Club and has been known to snap a few photos while on his bicycle.